The monumental Mannenzaal of St. Pieters and Bloklands Gasthuis is one of Amersfoort’s most beautiful historical gems and its 22 preserved sleeping alcoves are unique even for Europe. The intimate Chapel of 1390 with its beautiful boograms was used as a church until the beginning of 2014, but is now equipped for various uses. The atmospheric Mannenzaal, built in 1531, still has its original beddings, allowing visitors to get a unique view of how the hosts (as the residents were called) lived here. The venue is available for hire for concerts or presentations, lunch or dinner, a lecture or meeting, a wedding or memorial service. Whatever the occasion, the Mannenzaal and the Chapel offer you a special location with a unique atmosphere. 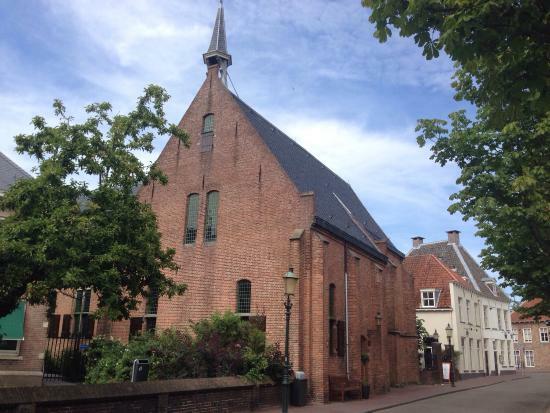 The Mannenzaal or the Chapel can be rented separately or in combination for various events. The beautiful historic location is a national monument and is ideally suited for a cozy party or reception, a private lunch, an intimate concert or other gatherings where atmosphere and hospitality are important.